Another satisfied beneficiary of the Climate Smart Village model is 58 year old Hasani Mukaha of the same village who has lived there since infancy. Hasani talks about how the model has changed the lives of many in the village. “Our village had lost its aesthetic value due to deforestation. We used to carry three loads of firewood per month using scotch carts for each household but because of the Tsotso Stoves we now only make two trips in four months. The model has not only helped us reduce the rate we cut down trees but through provision of seedlings and the establishment of a demonstration plot, it has taught us to grow trees everywhere as well as encouraging us to practice agroforestry thus helping to restore the beauty that had been lost” Hasani talks with hope beaming from his eyes. “From the agroforestry trials conducted in the demonstration plot, many people have adopted the idea and have begun planting several types of trees in their gardens such as Mangoes, Oranges, Minyii, and other fruits trees. 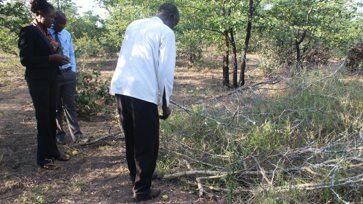 In addition, we are also planting trees we were told are good food for livestock such Moringa and Mulberry fruit trees. I personally am excited about these tress that will provide supplementary feeding to our cattle as most times we lose cattle in drought due to lack of sufficient pasture. Speaking of pasture, there have been trainings to help us reclaim our degraded rangelands. We have begun planting grass for livestock and creating a system where there is sustainable use of grazing areas by developing paddocking schedules. Looking back, we have come together as a village and participated in planting grass for our livestock, which is an activity that nobody had ever been exposed to but it has been an activity with tremendous results. When the rains came last season, the grasses whose seed we sowed in selected parts of the forest where our livestock graze, germinated in very large numbers. Most of the grasses reached maturity stage and produced seed which we decided to harvest for replanting. This has also prompted us to set our own village seed bank for grass and crop seed. To be honest, some of us saw the re-emergence of some types of grasses we last saw in the late 1970s. We had resigned to never again seeing these types of grasses here in our lifetime but the idea of rangeland recovery has brought us that hope. Now we can better plan for our livestock because we have seen enough evidence that grass can indeed grow back on the ground we thought it had become extinct.” Hasani adds on with pride. Following this, Hasani managed to elaborate a few more of the interventions from the climate smart village that they were benefiting from as a village “Using demonstration plots, us farmers have been capacitated on how we can continue agriculture in the face of the changing climate by experimenting with different crops and crop varieties to assess their appropriateness in terms of management, vulnerability to pets, yield and resistance for both experienced and projected climatic conditions after which farmers are then able to select the most appropriate for them. This together with the weather SMS notification system and the self-managed local rain gauge has helped us see which crops are best suited to our climate and so following this we are now championing the cultivation of drought resistant crops such as sorghum which is doing very well versus us growing maize year after year that used to fail. In addition we have been capacitated with on farm water management through the use of infiltration pits which has helped increase yield. Recently conservation agriculture implements have been introduced to the demonstration plots. Though we have not had the opportunity to use these implements practically, I am hopeful that through seeing their benefits, we will easily adopt them”. Dr Unganai then went on to explain how the Pahlela climate smart village had been set up. 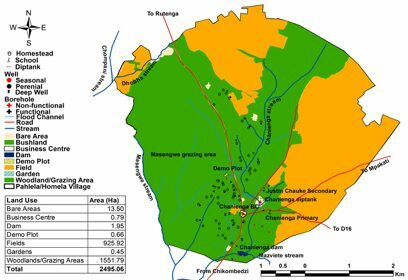 “The first step towards setting up of the climate smart village was planning for climate change by mainstreaming it into development processes of the village. This was achieved by carrying out resource mapping of the village, thus establishing which capacities and resources the community had to be better prepared for disasters related to climate change as well capacities and areas that needed strengthened in order to build the required resilience as shown by this map.” (Refer to Figure 1). For its setup and implementation, an integrated planning systems approach is being used, with different players from government institutions, NGOs and communities working together in a coordinated manner to shape the model. “We have many different partners and without them the model would be failing. Meteorological Services Department (MSD) and AGRITEX were influential in setting up the rain gauge and Tongaat Hullet, AGRITEX, Environmental Management Agency (EMA) and Department of Mechanisation and Irrigation Development are critical for the efficient functioning of the demonstration plots. 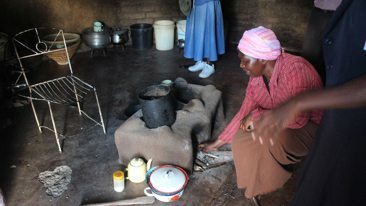 For the Tsotso Stoves, we had great help from Supporting Africa Life Trust (SALT). 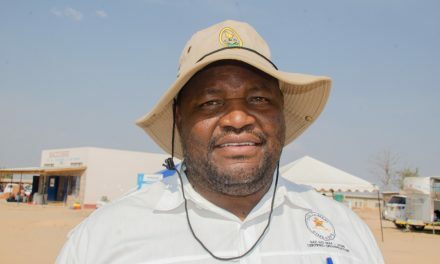 Lastly, Livestock Production Department (LPD) and Matopos Research Station are critical in rangeland reclamation with the aim to increase resilience by improving pasture which will in turn improve the quality of beef thus fetching higher income.” he adds on. “With cumulative efforts from various institutions, plans are underway to procure labour saving sorghum thrashers to improve quality of sorghum so as to fetch higher prices. There are also plans to install bio-gas digesters in the village. We also have plans to introduce the model in three other villages in the District” Dr Unganai concludes. 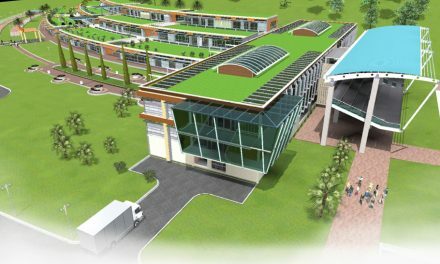 Based on the benefits being realised, the climate smart village model is thus proving to be an effective tool in reducing vulnerability of communities to climate change. The project therefore continues to work in Pahlela Village with knowledge smart interventions such as Village Landing and Savings and farmer-famer learning activities and linkages to market being implemented as a means to increase income for reduced vulnerability. The Climate Smart Village model is being championed under the Scaling up Adaptation Project with a focus on rural livelihood implemented by OXFAM through Plan International in Chiredzi and SAFIRE in Chimanimani and Buhera; and under the Scaling up Adaptation through Strengthening Integrated Planning Systems Project implemented by the Ministry of Environment, Water and Climate through EMA. PreviousClimate Change – Africa’s New Development Threat? NextWhy Governments in Developing Countries Do Not Learn the Basics of Hydro-Meteorological Disaster Risk Reduction?